MERIDEN - Carol L. (Spencer) Lesiak, 67, wife of Frederick Lesiak passed away peacefully on Saturday, April 4, 2015, at MidState Medical Center. She was born Dec. 22, 1947, in Meriden a daughter of the late James and Violet (Dodge) Spencer Sr. Carol graduated in the OH Platt High School, class of 1965, she was a member of the Pep Club and Bowling Club. Carol enjoyed a career in the welding supply business including Silver City Gas. She was a member of First United Methodist Church, Meriden, was a member of the Meriden Ski Club for 20 years. She loved planting her gardens, designing her home and cooking for her family and friends. In addition to her husband Fred of 48 years, she is survived by a brother, Jim Spencer, of Wallingford; a sister; Lovina Spencer Bailey, of Southington; a niece, Lynette Bailey; and five nephews; William Bailey, Dr. Robert Bailey,and David, Scott and Marc Spencer. She also leaves many great-nieces and nephews; as well as a close friend, Dorothy Barnhart. The family would like to thank Dr. Fumo, his nurse, Priscilla and the staff at MidState Medical Center for their loving and compassionate care of Carol. Funeral services will be private at the convenience of the family. The Beecher & Bennett-Flatow Funeral Home, 48 Cook Ave., Meriden has been entrusted with the arrangements. 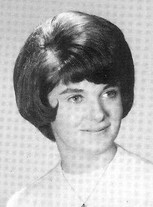 Contributions in Carol's memory may be made to the First United Methodist Church, 159 E. Main St., Meriden, CT 06450. To send a condolence please see obituary at www.beecherandbennett.com. Published in Meriden Record-Journal, April 7, 2015.